As a biological material timber's mechanical properties shows a large variability that turns extremely difficult strength assessment of timber elements in service. A study on mechanical characterization of Maritime pine timber non-destructively is presently being carried out. This presentation discusses the ability to predict compression parallel to grain and hardness by using two different techniques (drilling and ultrasounds), in laboratory conditions. Ultrasound velocity along and across the grain gave a good correlation with compression strength parallel to grain but a weak correlation with hardness. Drill resistance contrary to what expected showed a low correlation with either hardness strength or density, giving nevertheless a reasonable correlation with compression strength. This late result points out the need to combine information (multiple regression) from ultrasounds and drilling for prediction of compression strength along the grain. Timber's mechanical properties are affected by natural characteristics (orientation of loading regarding fibre orientation, density, knots and slope of grain) and by service conditions (moisture content, load duration), which turns extremely difficult the strength assessment of timber in service (residual strength). In Portugal most of the timber structures are made from Softwood species being today Maritime pine (Pinus pinaster Ait.) timber the major homegrown source of wood available for construction purposes. Strength grading by visual appraisal of Maritime pine timber elements is possible but a large degree of uncertainty is still present. This lack of confidence and natural safety reasons leads to replacement or strengthening of timber elements with an unjustified waste of material and higher repair cost. This scenario guides the studies about application of several non-destructive techniques (NDT) for in situ evaluation of timber strength (Ross and Pellerin, 1994). After more than thirty years of persistent research the results show that none of the NDT used so far can, by itself, give a clear estimate of the strength of a timber element in situ. Therefore it seems that only by the combination of different NDT can an estimate be obtained (Bonamini, 1995). This presentation shows some results of an on-going study on the evaluation of Maritime pine sound timber strength evaluated non-destructively by two different techniques (drilling and ultrasounds), in laboratory conditions. The mechanical properties studied are compression strength parallel to grain and hardness. Thirty test pieces of Maritime pine timber (Pinus pinaster Ait.) with 25x25x200mm were used. The test pieces were cut such that their faces were as close as possible coincident with tangential or radial wood sections. After measuring the velocity propagation of ultrasounds along (direct, indirect set-up) and across the grain each test piece were then cut into two test pieces: one (25x25x150mm) being used for compression parallel to grain and the other one (25x25x50mm) for drilling and hardness testing. The test pieces were conditioned in a climatic chamber at 20ºC± 2ºC temperature and 65%± 5% relative humidity, till constant mass was reached (average moisture content 12%). Before testing the test pieces were weighted and their dimensions measured for determination of density, according with ISO3131. The ultrasonic testing used 150kHz probes connected to a PUNDITPlus equipment, and measured the time-of-flight between transmitter and receiver probes. Three ultrasonic transducers set-up were used, Fig. 1. The general configuration used for strength grading timber is the direct transmission along the fibres, however this arrangement is not often applicable to timber members in service and is not compatible with a more realistic perception of a timber element as build up from clear wood zones and wood zones with defects (Machado, 2003). Therefore the configurations a) and b) shown in Fig. 1 were tested as alternatives to c) set-up having in mind their application to timber elements in situ. Fig 1: Ultrasonic testing set-ups. The test pieces were tested by means of a Drilling Resistance Measurement System, being the depth of the holes of 2cm using a 5mm diameter commercial bit. This drilling equipment was developed in a EU research project (HARDROCK PROJECT) and has been used for evaluating stone and treatments characteristics, Fig. 2. This test measures the resistance to the advance of a bit at a constant rotation and advance speed rate. A load cell fit in the equipment gives a direct reading of the resistance offered by wood material to the advance of the bit. The predictor parameter taken in this study was merely the mean resistance value obtained taking into account a drill depth between 2 and 20mm and only between 2mm and 6mm. This late case was selected given the wood volume directly involved in the hardness test. The first 2mm readings were not taken into account in either case since there was a clear effect of the profile of the bit point as it enters into the wood, not possible to associate with wood condition, Fig. 2. The drilling holes were opened in the radial direction (perpendicular to annual rings) assuring that each layer (earlywood and latewood) of the annual ring was assessed. The use of this equipment although not entirely non-destructive could be considered as such since no modification of the performance of the timber element is expected, given the small diameter of the holes drilled compared with the cross section of old timber elements in service. The test aimed to obtaining information about the cohesion of the superficial layer of the wood material and seeking correlation with density and hardness. The 25x25x150mm test pieces were tested in compression perpendicular to grain according with ASTM D143. Some of the test pieces could not be tested until failure since their strength exceeds the capacity of the machine load cell (4000kgf). Hardness tests were carried out on 25x25x50mm test pieces according with the hardness testing method described in ASTM D143. Due to their smaller dimensions as regards the standard lateral restrain of the test pieces were assured as proposed by BS373. Density is generally used to predict timber's mechanical properties, although several studies have shown a weak correlation between density and the majority of mechanical properties measured along the grain. In the present study a weak correlation was also found with compression strength parallel to grain, Fig. 3. Whereas for hardness a strong correlation is observed with 65% of the data variability explained by the regression line. Fig 3: Density as a predictor of timber compression strength and hardness. Fig 4: Relation between compression parallel to grain and hardness. These results seem to confirm that these two mechanical properties are driven by different failure mechanisms, therefore not being strange to found a weak correlation between them, Fig. 4. Consequently the use of velocity propagation along the fibres is expected to give a closer prediction of compression strength than hardness does. This is confirmed by the high correlation coefficients between the dynamic modulus of elasticity given by Eq. 1, Fig. 5, and compression strength parallel to grain when compared with the lack of correlation found between ultrasonic velocity and hardness, Fig. 6. Fig 5: Correlation between elasticity obtained by ultrasonic testing (Vd - direct set-up along grain; Vi- indirect set-up; Vt - direct set-up across grain) and compression strength. A strong setback of using this equation is the lack of information on density of timber elements in service. This was one of the reasons for using a drilling device. The result obtained, Fig. 7, nevertheless shows that the use of this device does not outcome a good prediction of timber density (coefficient of correlation of 0,56). Although the use of ultrasound propagation velocity only as a predictor of compression strength gives fairly good coefficients of correlation, Fig. 8, reliable information on density would increase significantly compression strength prediction. Fig 6: Relation between ultrasonic propagation velocity along the grain (Vd - direct set-up; Vi- indirect set-up) and across the grain (Vt - direct set-up) and hardness strength. Fig 7: Correlation between drill resistance and density. Hardness strength prediction could not be achieved from ultrasonic velocity as already shown in Fig. 6. Therefore, the mean resistance to drill over the entire length tested (2 to 20mm drill depth) were plotted against hardness strength, Fig. 9, showing a weak correlation. The same result was obtained when using the outer wood layer (mean resistance between 2 and 6mm drill depth of three holes). However a fair correlation coefficient is found between drill resistance and compression strength parallel to grain. Fig 8: Compression strength parallel to grain as a function of ultrasonic wave propagation velocity along the grain. Fig 9: Correlation between drill resistance, hardness and compression strength. These results do not confirm the suitability of using this technique for assessing hardness strength of wood. Having in mind the correlation (r=0,81) between hardness and density then a weak correlation between drill resistance and density, as opposite to expect, should also happen, which is confirmed from Fig. 10. Regarding drill resistance, it is clear that a more meticulous data analysis is necessary before drawing final conclusions. Fig 10: Correlation between density and drill resistance. The velocity of propagation of ultrasonic wave along wood grain gave a good prediction of the compression strength along the grain of Maritime pine timber test pieces. The alternative set-ups tested (indirect and direct step-up across the grain) showed results as good as that obtained by direct set-up along the grain, set-up used in several studies but not applicable in most of the situations in practice since the ends of the timber elements are not often available. However none of the NDT tested by it one could give an acceptable estimate of hardness strength. In this case the results show that a more exhaustive analysis of the drilling data collected is necessary before any final conclusion could be drawn. Given the correlation between the NDT tested and compression strength and the fact that they showed to be independent (weak correlation) multiple regression analysis should be explored in the future. This study was financially supported by Portuguese Foundation for Science and Technology (project nº POCTI/33967/AGR/2000). ASTM. 1994. Standard methods of testing small clear specimens of timber. D143. American Society of Testing and Materials. BONAMINI, G. 1995. Restoring timber structures - Inspection and evaluation. Pages D3/1-D3/9 in Timber Engineering STEP2. Design - Details and structural systems. Centrum Hout. BSI. 1957. Methods of testing small clear specimens of timber. BS373. BSI. ISO. 1975. Wood - Determination of density for physical and mechanical tests. ISO. MACHADO, J. SAPORITI. 2003. 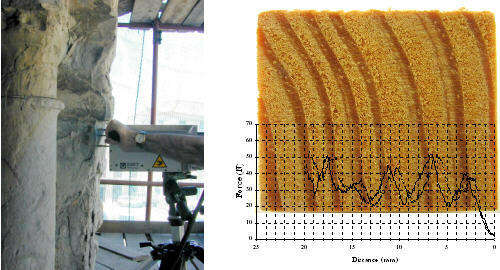 Evaluation of the variation of bending stiffness of Maritime pine timber by an acousto-ultrasonic approach. In 13th Symposium on Nondestructive Testing of Wood. Forest Product Society. (to be published). ROSS, ROBERT J. AND ROY F. PELLERIN. 1994. Nondestructive testing for assessing wood members in structures. A review. Report FPL-GTR-70. Forest Products Laboratory.